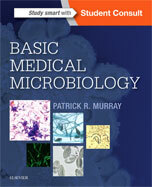 Authored by the lead author of the bestselling Medical Microbiology and written in the same tradition, Basic Medical Microbiology was designed as a straight-forward, practical introduction to this difficult topic. It provides students with a firm foundation in the principles and applications of microbiology, serving as an effective prep tool for examinations and the transition into clinical application. Carefully curated contents focus on the most commonly observed and tested organisms and diseases. Differential diagnosis, organism classification overview, and a list of antimicrobials used to treat infections are provided in the introductory chapter of each organism section, reinforcing the clinical application and relevance. Organized by organism; focuses on the association between an organism and disease. Concise tables and high-quality illustrations offer visual guidance and an easy review of key material. Clinical cases reinforce the clinical significance of each organism. Includes multiple-choice questions to aid in self-assessment and examination preparation. Evolve Instructor Resources, including a downloadable image bank, are available to instructors through their Elsevier sales rep or via request at: https://evolve.elsevier.com Student Consult eBook version included with purchase. This enhanced eBook experience allows you to search all of the text, figures, images, and references from the book on a variety of devices.